When the anime version of My Hero Academia (HeroAca from here on) was announced, the very first thing people speculated about was which anime studio would be entrusted with the task. Savvy fans were quick to cast their minds to studios affiliated with its distributor, TOHO Animation. One of these was studio BONES, who had made a name for themselves through their tremendous action scenes, and thus HeroAca seemed conceptually to be right up their alley. There was a catch, however! 3 of BONES’ 4 sub-studios already had projects announced for the near future and the remaining one was just finishing Noragami‘s second season. Assuming that the adaptation would be at least 24 episodes long, the idea of them being in charge was deemed almost impossible due to the obvious scheduling conflict. At the same time, there was a “leak” going around with a supposed staff list that seemed both too good to be true and also had BONES credited for the animation production. Funnily enough, the anime industry is unpredictable and leaks more than the roof of a poor animator’s apartment. Kenji Nagasaki, the director of the very popular Gundam Build Fighters and not so popular but nonetheless good Classroom Crisis, was announced to direct the series at BONES. The task of adapting Horikoshi’s art was given to Yoshihiko Umakoshi, a famous animator and character designer with a very idiosyncratic style. That turned out to be a fantastic choice, but we’ll save the details as to why for a bit later. A few months down the line, additional details were announced, including the length – 13 episodes. At last, things started to make sense – well, minus the part where a major Jump title entirely structured to be experienced through long arcs was getting such a short adaption, that was unheard of. While the show’s schedule was far from ideal, it was at least possible to finish it without massive outsourcing and delays. The staff was assembled and expectations were high. Now it’s finally time to focus on the topic that this article is truly about – the animation. The sub-studio in charge of HeroAca was (and still is, for its sequel) studio A, led by animation producer Naoki Amano. Most of the animation staff from Noragami Aragoto immediately moved to HeroAca, to the extent that you would see a huge overlap if you printed out the staff lists and did a side-by-side comparison of them. As it goes in the industry though, freelancers come and go between projects. In HeroAca‘s case, it was fortunate to be blessed with excellent artists making their way onto it. The driving force behind the show was industry veteran Yoshihiko Umakoshi, who I mentioned above. His style was present pretty much in every episode, to the point where he was still able to add his flavor to some of the most important scenes even after the schedule started to tighten in the latter half. As if that wasn’t enough, after the broadcast finished, he continued to do retakes for the scenes that he couldn’t correct, so the fans could enjoy higher quality content on the blu-ray release. Some of the characteristics of his style include thick outlines, detailed shading and body structure, and sometimes even lines painted with brush pen. I recommend checking all the key visuals and blu-ray covers for some unfiltered Umakoshi-style HeroAca. As the chief animation director, Umakoshi worked on every episode of the series. Typically the Chief AD’s role is to further supervise the corrections of the other animation directors, however, it’s not unusual for them to do “proper” animation direction – correcting drawings straight from the key animators – on key episodes (usually first and last) and the opening and ending sequences. The OP in some cases works as a teaser of what’s to come, and that was exactly the case here. The key animator list included studio BONES veterans such as Toshihiro Kawamoto and Tsunenori Saito, as well as an A studio regular action animator and animation director Kazuhiro Miwa, but also an incredible young talent in Hakuyu Go – who also contributed to the storyboard – all of whom all would later work on the show proper. The same can be said for the ED as well, which was animated by a BONES-affiliated veteran Koji Sugiura. On episode 1, Umakoshi handled the animation direction mostly by himself, with the help of assistant animation director Hideki Yamazaki, who was one of the Chief ADs on Noragami Aragoto. You won’t be surprised to hear that the key animator list was also full of staff returning from Noragami; one of them was Yuuta Kiso, Noragami‘s regular action animator, who did key animation for this sequence. What’s particularly visible here is Umakoshi’s input on the long punch short of All Might. I’d like to see what the original key frames for the scene looked like as Kiso’s style displayed in both Noragami and Dog Days was rather clean and without additional details, but that’s the kind of material that rarely is displayed publicly. At least here’s a look on the Umakoshi-fied version shared by HeroAca‘s official instagram account. Overall I’d say episode 1 was fairly polished and seemed to be close to Umakoshi’s ideals. It was episode 2 that offered us the first batch of surprises. The climax of the episode was animated by young animators Hakuyu Go and Itsuki Tsuchigami. BONES’ A studio has been one of the more conservative sub-studios as far as the recruit of freelance animator goes and having young animators such as them involved was rather surprising, despite Hakuyu Go’s work on the OP. Go’s only previous experience with BONES to this point was the final episode of Kekkai Sensen, where he animated the fight between Klaus and Despair. Kekkai Sensen was a shared production between sub-studios A and C – led by producer and new member of BONES’ board of directors Yoshihiro Oyabu. Not coincidentally, Oyabu is working on HeroAca as a chief producer; perhaps it was him who initiated this freelance-friendly movement, as Hakuyu Go would get a much more prominent role in one of the latter episodes. Other young animators who worked on this episode were Takumi Sunakohara and Naoki Miyajima. The animation directors in charge were Koichi Horikawa, an animator who’s been with BONES since the very foundation of the studio, studio C2C affiliated Ayana Nishino and Yuichi Fujimaki, another A studio regular. Episode 3 was outsourced to studio Nomad, known for productions such as Rozen Maiden and the very unfortunate original Yozakura Quartet anime. In recent years, they’ve been reduced to a simple outsourcing studio. This episode featured the work of Isao Hayashi, an animator best known for his work on A-1 Pictures’ [email protected] He animated the short scene of All Might crushing rubbish on the beach, neat cuts that really convey All Might’s strength in a casual way. Otherwise, as it usually is with outsourced episodes, it was a breather for the production to get ready for more important upcoming episodes. Kazuhiro Miwa is a key animator par excellence. His versatility enabled a career that includes works in roles such as character design, animation direction, mechanical animation direction, plus key animation for breathtaking action sequences regardless of whether they featured characters or mechanical beings. Maybe that’s the reason why he was picked to do animation direction for the first half of episode 4, which featured both humans and mechs fighting! As pure animation with ambition though, supervision isn’t enough for Miwa – he has to animate the episode highlight by himself! As Eureka Seven’s director Tomoki Kyoda once said, “Miwa is a person who draws really well and with the speed of a demon”. The animation direction for the emotional second half of the episode, after all those intense moments, was handled by Yuichi Fujimaki instead. As things turned out, it wasn’t only Noragami’s staff that had moved onto HeroAca. As the show was advancing, staff from the recently finished Snow White with the Red Hair joined the party in order to rescue the show from total production collapse once the schedule had gotten too tight. One of Snow White’s chief ADs Tsunenori Saito worked on episode 5 as the assistant animation director under A studio regulars Hideki Yamazaki and Eiichi Akiyama. Takahiro Komori, another chief AD from Snow White, did key animation for the flashback of Bakugo destroying the training robots. Unsurprisingly, both of them continued to work on the show until the end. 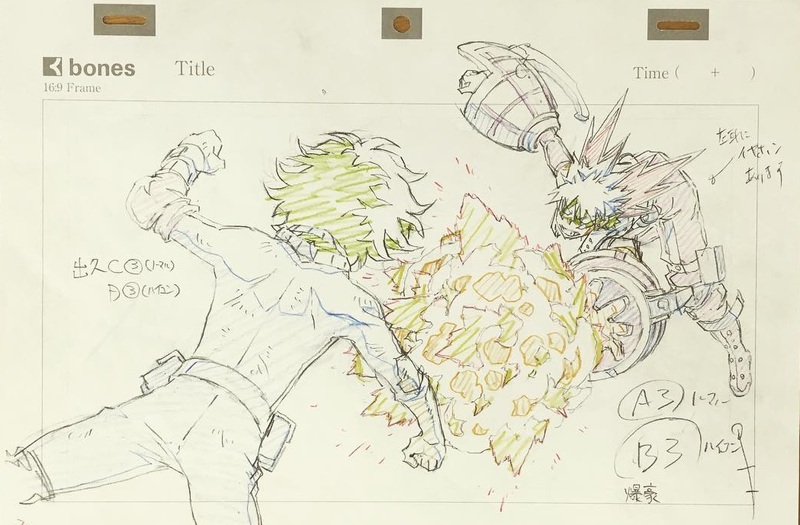 Key animator Naoto Abe animated Deku’s throw, with heavy corrections by chief AD Umakoshi, as hinted by the unusually thick outlines. Episode 6 marked the point when the tight schedule finally started to show on the staff list. 2 animation directors and 4 assistants is clearly far from ideal, and while the episode still looked fine, I personally started to worry a bit – especially when the next one was meant to be the first main action episode. Episode 7 had an impressive pedigree that raised expectations. Animation directors Kazuhiro Miwa, Tsunenori Saito and Yuichi Fujimaki assisted by Gundam BF’s character designer Kenichi Ohnuki, Hideki Yamazaki and Umakoshi himself on top of doing chief animation direction. While many people understandably complained the action was too static and followed the manga panel-by-panel, there were still some interesting bits that are worth highlighting. 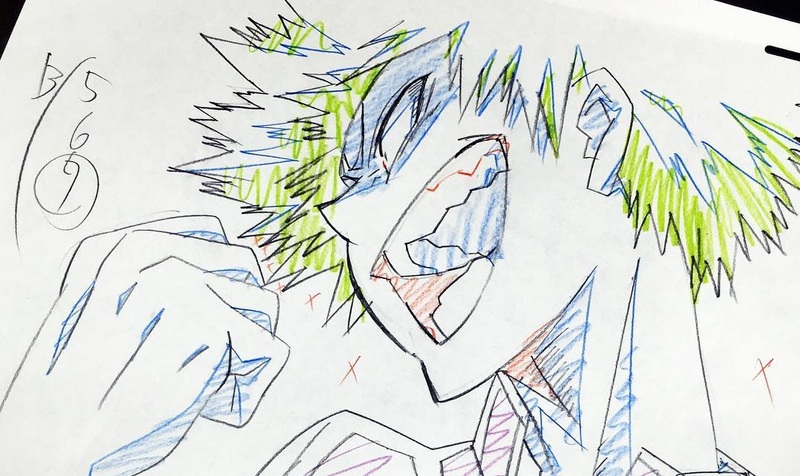 Bakugo and Deku’s intense one vs one showdown was animated by BONES veteran Kenji Mizuhata. Mizuhata worked as animation director on Kekkai Sensen and Noragami, but decided to step down and focus on key animation on HeroAca. The climax of the fight, again featuring some heavy corrections by Umakoshi, was animated by Itsuki Tsuchigami, a young talent who previously showed up on episode 2. 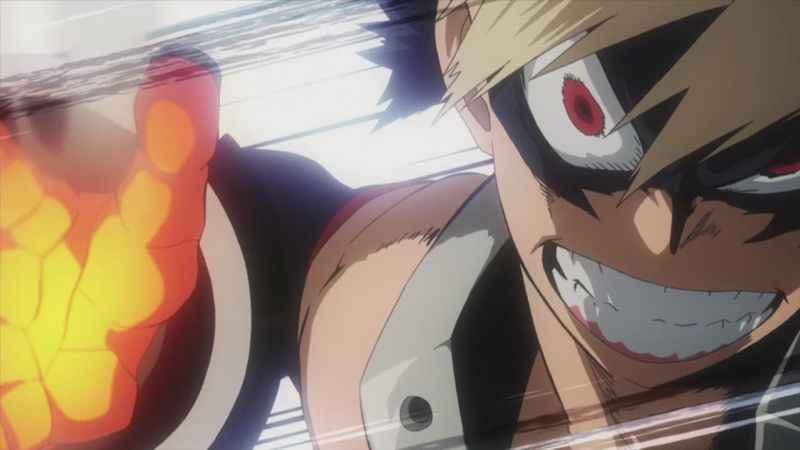 As the title of this post suggests, one of HeroAca’s strengths was that it allowed experienced and young animators to work side by side, and this episode was one of the examples. One of Kenji Mizuhata’s key animation frames. Episode 8 was the second outsourced episode, once again to Nomad. This time it was just barely functional, with the final confrontation between Deku and Bakugo being yet again corrected by our overworked chief animation director/angel Yoshihiko Umakoshi. The tight schedule finally hit with full power on the following episode 9, which was also the one with the highest number of animation directors in the series – 4 regular ones and 6 assistants. It stays as the only episode where even the fans who generally don’t pay attention to production matters noticed something was off and complained, especially about Shigaraki’s invasion to USJ. The segment was supervised by Koichi Horikawa, who’s one of the least popular animation directors at BONES due to his inconsistent nature. It’s not like he’s not working hard enough, but over the years I’ve noticed his drawing style often doesn’t match with the character designs. On the other hand, he’s done many excellent episodes throughout his career. Hence he’s simply inconsistent. When the production of Kekkai Sensen’s OVA had ended, another one of BONES’ big names rushed to assist HeroAca’s production with episode 10. Toshihiro Kawamoto, character designer of titles such as Cowboy Bebop and Wolf’s Rain did animation direction together with Kenichi Ohnuki and Saki Hasegawa. Umakoshi’s general style was pretty much gone at this point as he started to focus only on the most important scenes, but despite that, this episode looked a lot more solid than the preceding two. Eraserhead got a nice bit of action animation and the climax of the episode featured some impressive water effects work. Episode 11 followed in the similar vein. With any attempt at consistency having become suicidal, the styles of each animation director became even more visible, especially Tsunenori Saito’s. Eraserhead received some more notable animation; Kazuhiro Miwa animated Iida’s escape, and Yoshihiko Umakoshi corrected (or redrew entirely, more like) All Might’s arrival. Now we’ve gotten to the most important episode, which not by coincidence also happens to be the one that defined the title of this post. On one side, we have veteran animators like Toshihiro Kawamoto, Takahiro Komori, Kazuhiro Miwa and Tsunenori Saito credited for assistant animation direction. On the other side, we have impressive newcomers lead by Hakuyu Go as the storyboard artist and director for the fight between All Might and Noumu. Expectations for this fight were high among the fandom, but I doubt anyone predicted a showcase of fresh animation talent like the one we were given. Hakuyu Go greatly extended the fight compared to its manga counterpart and together with a veritable animator army (featuring the likes of Toshi Sada, Naoki Miyajima, Toya Oshima, Itsuki Tsuchigami and more) animated the hell out of it. The finisher was animated by none other than Hironori Tanaka, while Kazuto Arai handled Noumu getting blown away, bringing this outstanding sequence to an end. While the rest of the episode looked about as unpolished as episode 9, everything was forgiven due to that payoff. I’m eager to rewatch the blu-ray version as it looks like Yoshihiko Umakoshi corrected lots of shots that he didn’t have time for during the broadcast. The final episode brought back some of the Umakoshi polish that was missing in the previous ones, mainly due to him not having to worry about any further episodes and thus being able to focus more on actual animation direction next to his chief AD duties. It was a safe but satisfying farewell to an enjoyable and fun series that…will actually return this spring! But this time in an even more mainstream TV timeslot due to the untimely death of the Nichigo slot it belonged to, presumably twice as long and with a way better production schedule. That sounds very promising on paper, and the latest PV seems to confirm that it’s going to be a blast – it even features animation work of fan favorite Yutaka Nakamura! Here’s hoping for another combination of veteran animators and young talents! Excellent post! Really looking forward to season 2! I don’t thin s2 will be longer, they’re just re-airing s1 on the new timeslot in the Winter season and continuing off with s2 in Spring. That’s actually not true. They’re re-airing season 1 only on ytv (Kansai region channel) in a late-night timeslot called MANPA. Season 2 will air in a ytv/NTV 5:30pm timeslot (before Conan) which hasn’t aired an anime shorter than 2 cours yet. Huh, interesting, thanks for the clarification and info. I hope they don’t go into filler territory. I’d much rather them get into the Stain arc or something. Stain was teased the moment S2 was announced, which only makes the idea that it’ll be 2 cours this time around sound more likely. Just wanted to mention that all the booru links starting from the episode 7 analysis are broken! Otherwise it was a great and interesting analysis, thanks for the hard work.